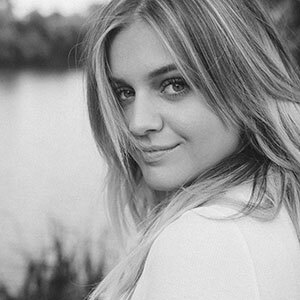 Kelsea Ballerini was born on September 12, 1993 in Mascot, TN, but she grew up in Knoxville. Now, Kelsea is beginning a tour in the year 2019, and has just recently celebrated her one-year anniversary with husband Morgan Evans. Her net worth is $6 million. Kelsea was a church choir girl, who belted out hymns every weekend for the majority of her childhood. As an only child, she was doted on quite a bit by her parents, Ed and Carla Ballerini. Her mother enrolled Kelsea in dance classes when she was just three years old, and she would continue to take them until she was almost a teenager. When she was twelve, she wrote her first song. That is where her love of music truly blossomed, her first song was written about her mother, and was cherished. She began writing more music at age 13, and eventually learned how to play the guitar a year later. At fifteen years old, she wound up in Nashville where she tried to pursue a music career. That didn't pan out the way she was expecting it to, though, and she ended up attending high school in Franklin, TN and eventually went to college at Lipscomb University for something unrelated. Kelsea Ballerini didn't begin to pursue her singing career again until after she had already begun and left college, two years after trying for her degree. Her career began when she signed with Black River, where she debuted her song "Love Me Like You Mean It", in 2014. In that same year, she was named one of CMT's Next Women of Country. To say that Kelsea's rollercoaster had taken off is an understatement. In May 2015, she released her first album, which peaked at a number 4 spot on the country music charts. More success came Kelsea's way as she released singles "Peter Pan" and "Dibs" of her debut album. Kelsea is the first female artist since Winona Judd to have all three of her singles from a debut album hit the top of the charts. In 2017, she was part of Forbes "30 under 30" list, and made it to the number 2 spot. In that same year, she also announced that she was going to be releasing a new album entitled Unapologetically, which debuted at number 3 on the country music charts. In late 2018, Kelsea Ballerini moved across genres of music when she released a duet with the Chainsmokers called "This Feeling". Kelsea Ballerini and Morgan Evans were engaged on December 25, 2016 and had wedding on December 2, 2017. Her husband, Morgan Evans is also a country music singer from Australia, and the two have quite the whirlwind romance. Kelsea's rising star is really shining, her biggest moments are yet to come, she will continue to grow and become a powerhouse in the country music business. Kelsea will also be joining the cast of "The Voice" as a coach this season, where she will help one aspiring singer live their dreams just as she has. As Kelsea becomes more well known, her star will certainly shine brighter.